You cannot delete a patient record. However, if you have created a duplicate patient record, if a patient record is not valid, or if the patient is no longer with your practice (such as when a patient is deceased), you can change the status of the record to Inactive to indicate to yourself and others that no information should be entered into that record. On the Basic Info tab of a patient's Patient Information page, change the patient's Status to Inactive. Note: You can include inactive patients when searching for a patient by setting the Include inactive patients switch to On. To prevent automated recare email and text messages from going out to the patient, remove the patient's recare. If the patient is the primary contact and/or the primary guarantor for other patients, set a different patient as the primary contact and the primary guarantor for those patients. Remove the patient's email address and phone numbers. On the Basic Info tab of a patient's Patient Information page, change the patient's Status to Inactive. Click (or tap) Save. Delete all the patient's future appointments. If the patient has a Ledger balance, either post adjustments to move the balance to another patient, or write off the balance. 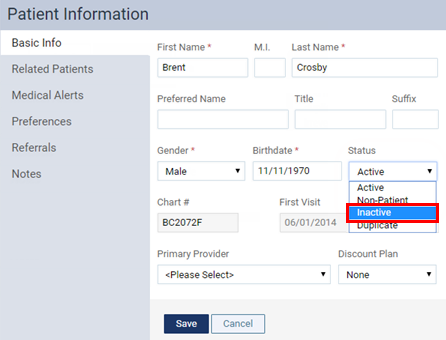 Add patient note in the patient's record that states that this patient's account is not to be used, and select the Add all pages check box.